In this program you will be guided through your one-on-one transformative workout sessions to help you achieve better overall health and a complete body transformation. Here, you have the option of 30-45 minute workout sessions. We recommend the 45 minute sessions for best results for fat loss and muscle toning. You also have the choice of our thirty minute sessions which are also highly effective in transforming your body. Couples and group training sessions are available for family or friends and all ages are welcome. Let us know how many there are in your group and we will work out a price plan for you all to transform your health and bodies. These consultations are for anyone that needs direction and a plan of action to train on their own. CAN’T MAKE IT TO OUR TRAINING STUDIO? Access Our Anywhere Anytime Workout Program. Our at home workout videos allow you to exercise at home in a hassle-free way. This program is designed to develop your body and to constantly improve your fitness level. If cost is an issue or you or you just don’t have extra time to get to our training studio, then our online workout programs are perfect for you! Workouts at home now CAN be just as effective with the proper tools! Complete at home exercises to fit your needs and desired effects. *Minimal pieces of equipment needed. *You can workout 24/7, anywhere, anytime and even in your pajamas. Click Here For Testimonials and 30 Day Free Trial! In this program you will be guided through your one-on-one transformative workout session to help you achieve better health and to completely transform your body. Our best home workout session is about 45 minutes or less and is the perfect fit for your busy schedule! No more excuses! The 75-minute transformation session is your personal time with Lacy for clarity, direction, and to learn the necessary tools to proactively transform your reality. In addition, you will be given one month free access to Lacy’s workout video library, which is the most beneficial way for individuals to learn how to do exercises at home to further promote your fitness and health. The 120-minute transformation session is your personal time with Lacy for clarity, direction, and a cleansing and transformative workout to physically enable your actual transformation. In addition, you will gain free access to Lacy’s workout video library to further promote your fitness and health in a healthy way. You can even workout at home or in your pajamas if you feel like it! Workout whenever you want, never worry about a gym class schedule again, not to mention the commute time! Motivate yourself to go beyond your limits and really focus on your workouts to build muscles at home. Building muscles at home IS possible with a little motivation and a lot of direction. Our workouts to do at home with videos by Lacy Weston’s team you will build the muscle mass you have been dreaming about. Believe it or not you can gain healthy muscle mass without any professional equipment all in your living room! Our program will show you how to perform exercise at home. The mission and journey of Lacy Weston is an inspiring story for people with a passion for becoming their best self. 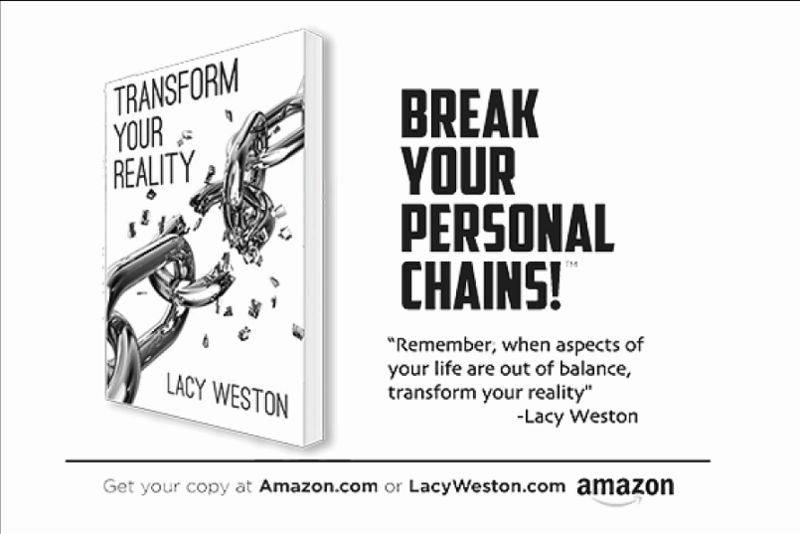 His book, Transform Your Reality, which is written about the success story of Lacy Weston and his experience in his life, is available for purchase on Amazon. The best at home workout and at home workout videos are available for a complete 30-day free trial! You can also contact Lacy Weston directly by clicking the Contact Lacy Button on the bottom of the page.